Claire and Ken Stevens approached architect Ko Wibowo to create a modern addition to their 1970s home in Tacoma, Washington. The couple’s needs had changed since Ken was diagnosed with Alzheimer’s a few years ago. The couple's house, designed by architect L. Jane Hastings in the early 1970s, is located on a steeply sloped site that backs up to a state park. Ultimately the aim of the design is to help Ken retain his memories and keep him safe. The addition’s beveled cedar siding will eventually weather to match the existing shakes, “but it’s different enough to distinguish the two,” says Wibowo. “The window frames and metal roof color also match the dark bronze aluminum of the existing house, so it all blends." Wibowo also notes that the window on the bridge between the two structures could eventually be replaced with a door if the couple ever want to build a ramp. 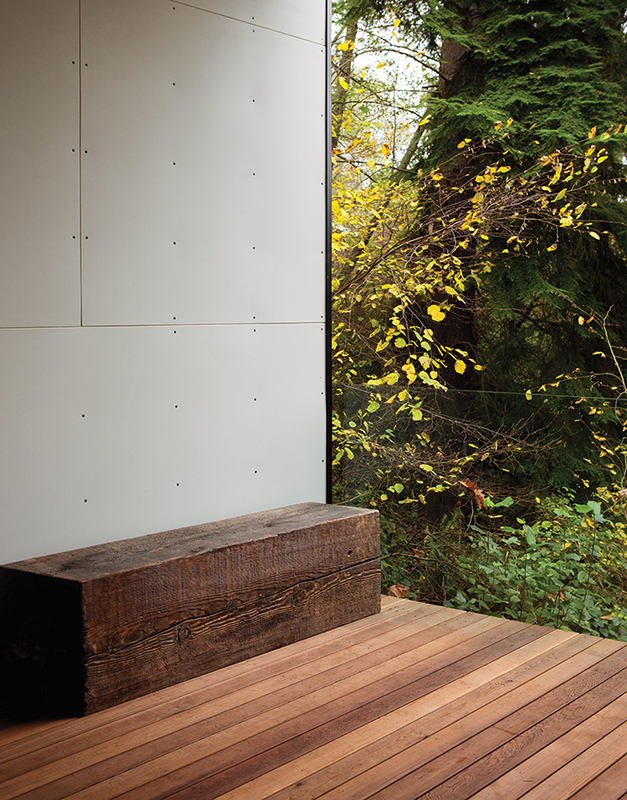 When Claire and Ken Stevens first contemplated building an addition to their home, it was plain that their needs had undergone a sea change since 1973, when L. Jane Hastings, a pioneering Pacific Northwest architect, had designed their house in the trees. Set on a tranquil, wooded site in Tacoma, Washington, the bi-level structure is filled with artwork, books, and one-of-a-kind treasures collected around the world—testaments to the couple’s rich and varied life together. When Ken was diagnosed with Alzheimer’s in 2009, architectural features that they had once negotiated without a thought—the steps leading to the front door, the two-step changes of level inside, the flight of stairs to the bedroom and master bathroom—all became potential hazards. A chemistry professor who discovered a passion for ceramics in the late 1960s, Ken Stevens had a successful career as both a potter and an influential teacher at the University of Puget Sound. Now 75, he and Claire moved into uncharted waters as they coped with the challenges that typically accompany the disease: progressive memory loss, difficulty with motor planning and expressive language, and assorted health problems. Moving was out of the question, but something had to be done to make the house safe and habitable for Ken. Through Hastings, they were introduced to Ko Wibowo, an Indonesian-born architect based in Puyallup, Washington. Wibowo met with the couple, whose stipulations were surprisingly few: a bed and a bath on one level. Taking the topography and the original structure as his cues, the architect designed an open, accessible space that would promote a sense of familiarity, while accommodating caregivers as Ken’s disease progressed and his ability to manage his daily needs declined. Clad in beveled-cedar siding that will naturally weather to match the shingles on the main house, the addition is reached via an interior bridge and a large pivot door from the living room. There, the old oak floors give way to solid maple, while generous windows and high, slanted ceilings allow for abundant natural light even on cloudy days. 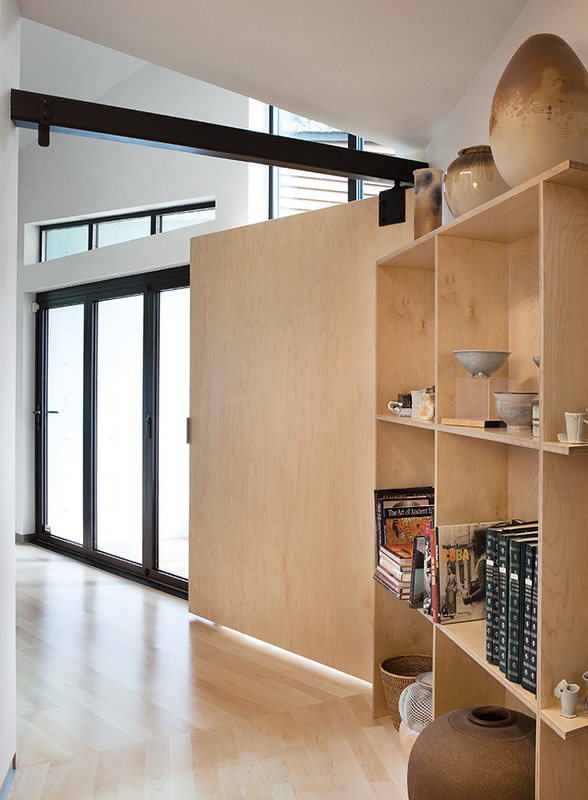 Built-in cabinetry keeps freestanding furniture to a minimum. Wibowo opted against a door for the spacious bathroom so Ken could easily move in and out. “All the doorways are at least three feet wide,” says the architect, “and there’s a five-foot turning radius in the bathroom.” The wall-mounted sink and toilet enhance accessibility, as does the roll-in shower, which contains a fold-down teak bench. The emphasis on aesthetics as well as function suits Claire. “I didn’t want this to look like a hospital room,” she says. Contributing to the feeling of familiarity, Ken’s ceramic plates, vases, and other vessels, all defined by his signature glazes, are displayed on open shelves in the bedroom. 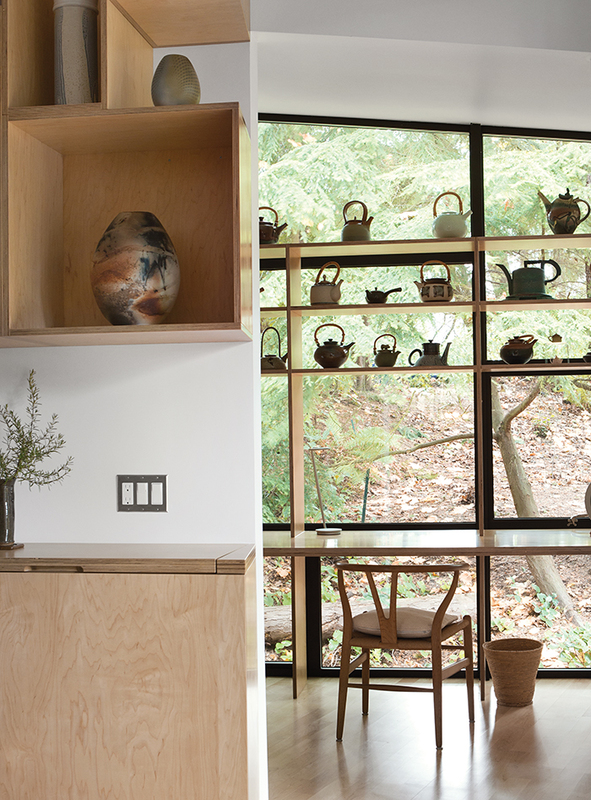 In the study is his collection of teapots—some of which he made, others he acquired from fellow potters or gathered on visits to Japan. 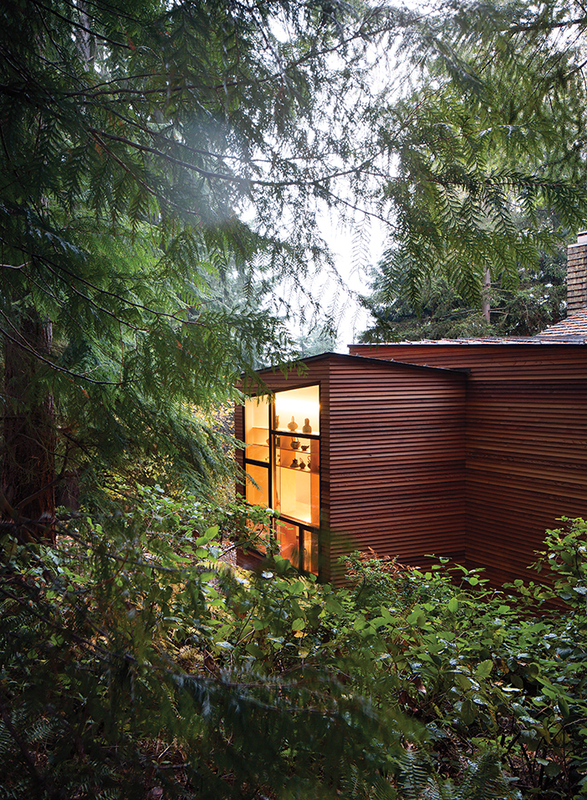 A few steps from his reclining chair is the semi-enclosed deck, where he can take his walker to look at the Douglas fir, madrone, and vine maple trees. Wibowo says he’d like to install a hanging garden so Ken, who used to maintain the landscaping, can put his hands into the dirt. For now, he remains safely at home, surrounded by the things that he loves.